If you are planning to work from home, then consider jobs in healthcare. Working from home appeals to all the moms, as it allows you to decide your work hours, be home with your children and enjoy family life. One of the most popular industries for work-at-home moms is healthcare. Traditionally, the nursing profession means working long hours on your feet all day. 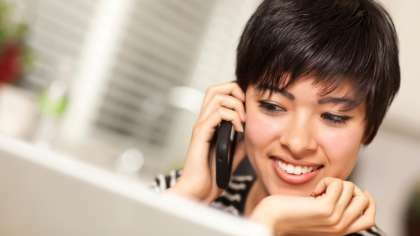 As a telephone nurse triage, you have the opportunity to guide a patient over the phone and help the patient's family to address the medical issue. Health insurance companies are also using part-time nurses for telecommuting positions. Occasionally, you might need to visit a patient at their home, but most of the interaction is done via telephone. If you have experience with both healthcare and writing, then you can try healthcare writing. Depending on your experience, the topics could include pregnancy, infants, toddlers, preschoolers, teens, young adults, and general health topics. Medical transcription requires you to transcribe medical records which many include patient history, physical reports, clinic notes, operative reports, discharge summaries, psychiatric evaluations and lab reports. These are usually dictated by doctors and other medical professionals. There is a level of knowledge and experience needed to be a medical transcriptionist, as you will need to be able to decipher the medical language used on the tapes. As a healthcare trainer (or coach) you can teach people about healthy eating habits and the importance of physical activity. If you are good with numbers and have an eye for detail then the job of medical coder is for you. As a medical coder you will perform administrative jobs like reviewing, processing, and submitting medical claims to billing offices. Occasionally, you may have to interact with the physicians or any other medical professional for additional information. You also may need to contact insurance companies to inquire about claims. Other option can be to search the local media, like a region specific healthcare magazine or newspaper. You can also advertise in the magazines of your area, or you can drop a copy of your resume at your nearby health insurance companies. These are just a few of work-from-home jobs in healthcare sector. If you have a background in the medical field, there are lots of great opportunities for you to work from home.